This past weekend I competed in my first (and probably last) triathlon. My roommate and I trained and performed together and I could not have done it without her. Thankfully, I was only two minutes slower than my "target" time which made me one happy girl. 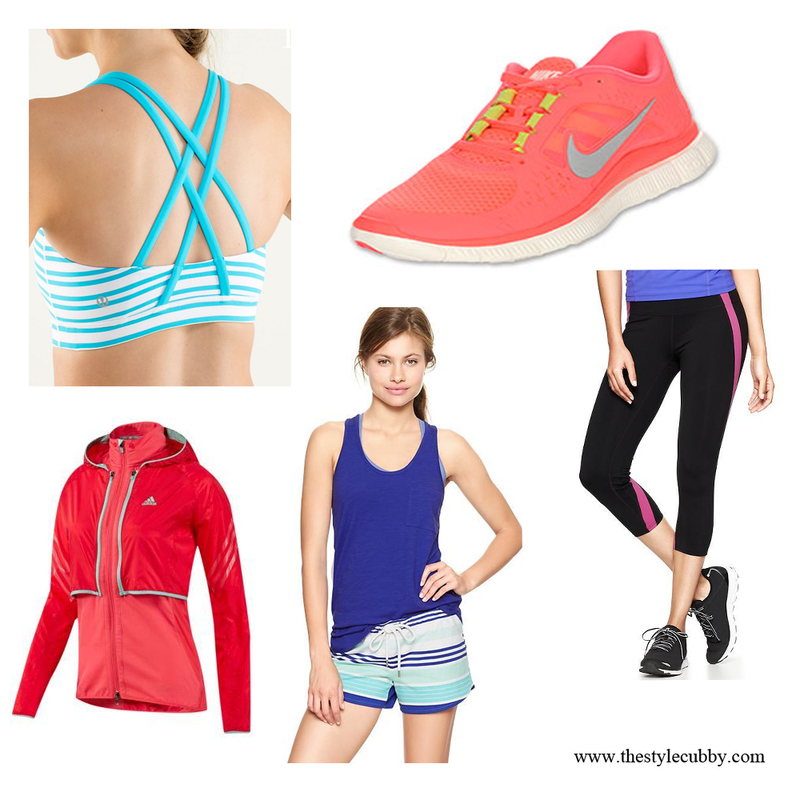 When working out I tend to daydream and to get myself through the swim, bike, and run, I decided to daydream about new work out clothes. Some I have and believe are great investments while others are new-to-me pieces that I lust after. energy bra - lululemon: I recently purchased this sports bra via the recommendation of a friend. I was hesitant to spend the $48 on a sports bra but I have to say it is quite possibly my best investment. It holds the girls well in place and I feel secure in every activity, whether it be a casual walk, a spin class, or an afternoon run, I don't worry that I am "bouncing" too much. As I retire old sports bras, I plan to replace them with more of these. Nike Free Run+ 3: To train and run, I wear Asics. I have a very high arch so I need a lot of support. However, I have been wanting to invest in a pair of "fun" sneakers. To walk around the city in, wear on a lazy Saturday afternoon or go for a quick walk on the beach. You see, "supportive" shoes are never cute or pretty, they are mostly clunky and big. So having a fun pair to wear during not to strenuous activies seems like a good idea to me. Nike Free's have many different patterns, colors, and fun options. They even have a custom option that you can add a monogram! Gap Gfast Capri's: I have these in the full length legging as well as the capri's, both in solid black. They are the thickest leggings I have ever found, really hold me in, and never lose their color. There is nothing worse than black fading and these do not. I wear the full length leggings not for working out but instead as normal everyday leggings. They keep me warm and I know I never need to worry about them being see-through. Gapfit Pocket Tank: I used to be all about working out in T-shirts. I think it started in college when my gym didn't allow anyone to wear sleeveless shirts and my overwhelming about of sorority tee's. In the past year I have transitioned into only wearing tank tops. They keep me cool, give me shape and allow me to move easily. I don't think I could ever go back to the grimy old T-shirts, those are now reserved for pajamas. adidas Supernova Adjustable Jacket: I am not one to wish away summer but before I know it the leaves will be changing and running outside will require more layers. Not only do I love the color palate of this jacker (hello, pink) I also like how it would give my body shape while being breathable.